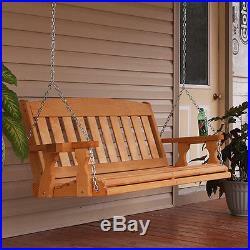 Amish Heavy Duty 800 Lb Mission Treated Porch Swing With Cupholders. Made from #1 kiln-dried pressure treated pine. Timeless Mission style features thick backrest slats. Two side cupholders provide unobstructed use of the armrests. Authentic Amish handmade craftsmanship. One inch thick slats attached by screws. Proudly Made in the USA. Our slats are routered (no sharp edges) and all sides and ends are for your safety and comfort. Swing comes with hanging chains. Available unfinished or in 4 eco-friendly soy based stain finish options. Advanced Bio-Based Technology, Penetrating & Non Film Forming, Rejuvenates, Preserves & Protects, Long Lasting UV Protection, No Stripping For Recoats, Green Building Compliant, Virtually Odorless, and Eco-Friendly. Outside Dimensions: 51W x 27D x 24H inches. Seat Dimensions: 46W x 19D x 22H inches. Weight Capacity: 800 lbs. Outside Dimensions: 63W x 27D x 24H inches. Seat Dimensions: 58W x 19D x 22H inches. Cupholders add 9.5 inches to the total span. Swing comes with enough chain to hang from a standard 8 foot ceiling. The item “Amish Heavy Duty 800 Lb Mission Treated Porch Swing With Cupholders” is in sale since Friday, March 11, 2016. This item is in the category “Home & Garden\Yard, Garden & Outdoor Living\Patio & Garden Furniture\Swings”. The seller is “porchtopatio” and is located in United States. This item can be shipped to United States.